This monthly feature profiles a plan included in Planning for All New Yorkers: An Atlas of Community- Based Plans in New York City, an interactive, online tool created by the Municipal Art Society and the Community-Based Planning Task Force. In New York City, the most common stereotype about community-based planning is that communities don’t want change. Detractors often say that, if communities were to make substantial planning decisions, the City would never see growth and development. However, Manhattan Community Board 9 in Harlem proved this stereotype untrue with Sharing Diversity Through Community Action, their 197-a plan, adopted by the City in 2007. With Earth Day this month, we highlight this plan, which is heavily focused on growth, development, and sustainability. Since 1989, the New York City Charter has included a provision allowing community boards, organizations, and/or local elected officials to create comprehensive plans for the future of their districts, known as 197-a plans. 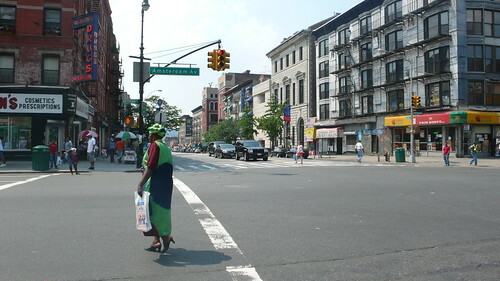 Manhattan Community Board 9, which serves the neighborhoods of Morningside Heights, Manhattanville, Hamilton Heights, and Sugar Hill, began the process in 1991. After initial submission to and rejection by the City Planning Commission, they began revisions with help from the Pratt Center for Community Development. Community board members and representatives from the Harlem Community Development Corporation and Pratt Center met regularly for over 20 months and held monthly public meetings to get community input on the plan’s recommendations. They also held three community-wide forums in 2004. Based on these meetings, they created a Community Feedback Table to address each issue and set out actions. This insured that community concerns guided the plan from the beginning. Provide for future growth while preserving the district’s physical and demographic character without displacement of existing residents. These goals were furthered by a number of recommendations in the areas of land use, urban design, transportation, economic development, environmental sustainability, housing, and community facilities. Among the notable recommendations were: to study and adopt contextual, as well as inclusionary zoning; to establish a network of bike paths in the district; to support local business development; to target underbuilt sides for affordable housing development; and to expand historic district designation. The plan also looked to Mayor Bloomberg’s sustainability agenda, PlaNYC 2030, as a guideline, and the board made recommendations promoting sustainability; for example, that the district establish strategies for waste prevention and become the city’s first Zero Waste zone, that new construction use green building technology, and that the district implement a green roofing strategy. Overshadowing this plan, however, was Columbia University’s plan for expansion. Announced in 2003, Columbia’s plan required the use of eminent domain to acquire private property in Manhattanville in order to expand its campus. In 2007, the City Planning Commission and City Council considered the two plans simultaneously, and approved both, despite the fact that much of Columbia’s plan went against the goals of the 197-a plan. CB9 suggested modifications to Columbia’s plan that would have brought the two plans into closer alignment. For example, the board asked Columbia to pledge not to use eminent domain, to preserve built resources deemed significant, and to find alternatives to the construction of a seven-story, below-ground, multi-lot cellar to house labs and mechanicals due to environmental concerns. However, the City passed Columbia’s plan without these changes, and many in the community felt poorly served by the decision making process. The Community-Based Planning Task Force is currently in the process of drafting legislation that seeks to give much-needed “teeth” to 197-a planning, so that such conflicts may be avoided in the future. All was not lost for the 197-a plan, however. Since its approval, Manhattan Borough President Scott Stringer created and the City passed the West Harlem Special District to further the plan’s goals in areas not affected by Columbia. And, although the State approved Columbia to use eminent domain last year, the university still faces an ongoing lawsuit. For more details on Manhattan Community Board 9’s 197-a plan, please visit the Atlas of Community-Based Plans, where you can download a detailed summary.